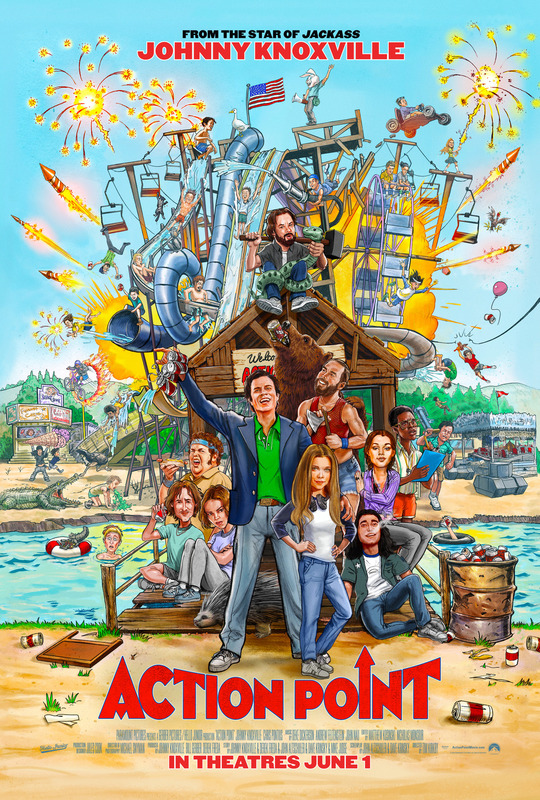 Johnny Knoxville stars as D.C., the crackpot owner of a low-rent, out-of-control amusement park where the rides are designed with minimum safety for maximum fun. Just as D.C.’s estranged teenage daughter Boogie comes to visit, a corporate mega-park opens nearby and jeopardizes the future of Action Point. To save his beloved theme park and his relationship with his daughter, D.C. and his loony crew of misfits risk everything to pull out all the stops – and stunts – making for another wild ride from Knoxville. We see a badly burned Action Point bear mascot sitting on the porch next to the real bear surrounded by empty beer cans. The Mascot stands up to leave. The bear growls. The mascot waves him off, turns around, stumbles and falls.